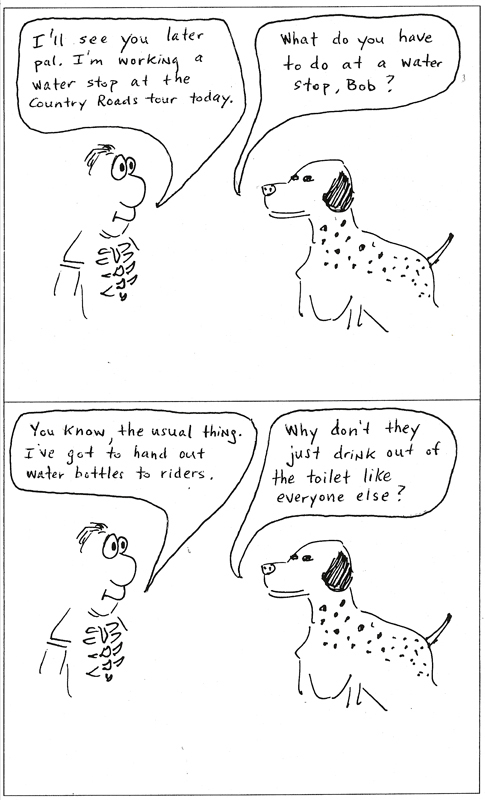 Editor's Note: This cartoon introduces SlingShot's (and the Black Widow's) little girl puppy dog Spatz, whom Bob is shown leaving while he himself goes out to play. Spatz is a German Shorthair Pointer (GSP) of which there are known to be 4 other examples along American Road Cycling favorite ride routes. Apologies are in order for the glaring mistakes Dr. Art has allowed to creep into this comic. First of all, Bob did not actually help out at all with this year's Country Roads ride due to his continuing boycott of the local club. The other mistake in the comic is in the way Bob is portrayed as "speaking" to his dog. In fact, Spatz does not reveal any accent whatsoever in general conversation.